This has been a glorious week for fans of both video games and retro science fiction, it would seem. First we took a trip to an alternate 1980 with Quadrilateral Cowboy and now Double Fine and Adult Swim Games bring us back to the far out and funky distant future imagined by the 1970s with Headlander, an homage to the more outlandish science films of the era like Logan’s Run and Zardoz contained within a metroidvania game. 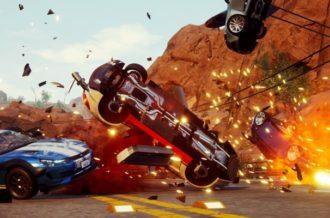 Now, this is a game coming to us from two of the biggest names in indie games today, and like many of the other games they put out, it comes with a highly creative concept and a quirky little twist to it all. But can such a collaboration actually live up to the standards created by the best that these titans have previously bestowed upon us? Spoiler alert: Hell yes. 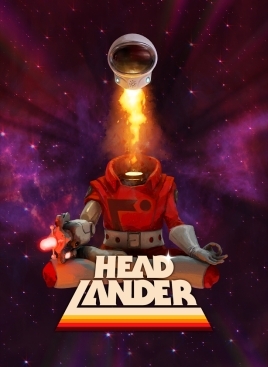 Headlander puts you in the shoes helmet of a person who is seemingly the last living human being in the galaxy – or the last living human being’s head, at least – found floating around on a spaceship by a man with a trucker-like voice known as Earl, who remotely frees you. After you choose which of three heads you want to be, you’re eventually led to fly your cranium around and hijack a spaceship to escape to a seemingly utopian city on a space station, where the remains of humanity have all uploaded their minds to robot bodies and a ruling artificial intelligence known only as Methuselah has implanted a device called the Omega Chip in all of them, keeping everyone in a perpetually blissed-out state. But Methuselah also has an interest in your floating noggin for some reason, thus leading you to seek out some answers along with Earl and a plucky group of rebels. 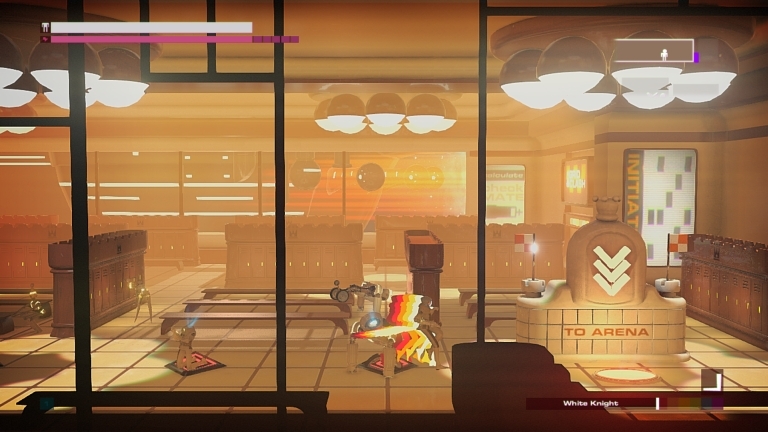 But let’s start off with the obvious: As a game devoted entirely to capturing the spirit of 1970s zeerust, Headlander’s aesthetics are absolutely top-notch. Even when the game gets into the more darker moments near the end, it still manages to keep a palette of vibrant color going that’s always a treat to look at. Backgrounds are filled with the likes of giant lava lamps, old-school monitors with retro fonts, giant stone beards that service as PA systems, and prog-rock inspired outdoor views of the cosmos, among many other spectacular details. B-movies are also in effect when it comes to the character design as well, with many of the robots having outlandish expressions and animation that wouldn’t feel out of place in the likes of Futurama as well. Musically, synth scores and funk guitars tend to be the main course, and they do a perfect job of helping to craft the atmosphere. Heck, the whole experience is practically worth it just to see with kind of insane and groovy locations and props the game has for you next. 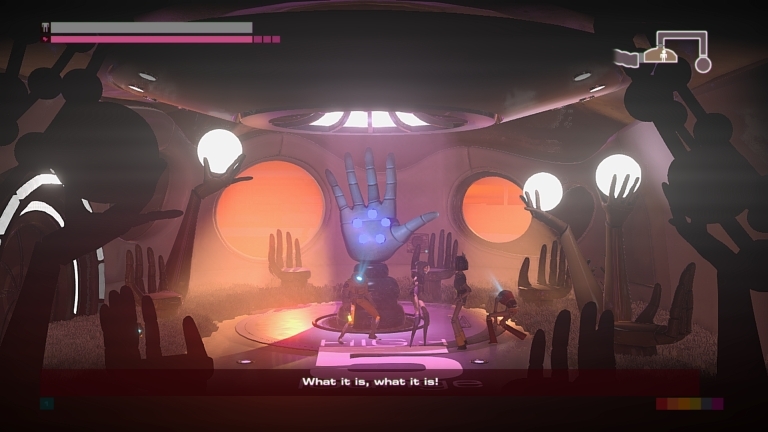 Unsurprisingly, Headlander also has a nifty sense of humor when it comes to its world as well, from the initial scenes of citizens zonked out over huge shag carpeting and areas solely devoted to high fives while asking you what your sign is to Mappy, the constantly upbeat yet depressed robot who keeps popping up in your travels with chuckle-worthy and specific lines delivered by Richard Horvitz (and which leads to a highly enjoyable payoff that I won’t spoil). The only weak link is R.O.O.D., the female security system manning the various colored doors. Not that she isn’t funny, she has a lot of great lines indeed. But she delivers them every time you enter through a door or if a door gets shot and opens, which in a metroidvania game featuring a lot of backtracking and gunfights, means you will end up hearing her snark eventually repeat itself over and over. 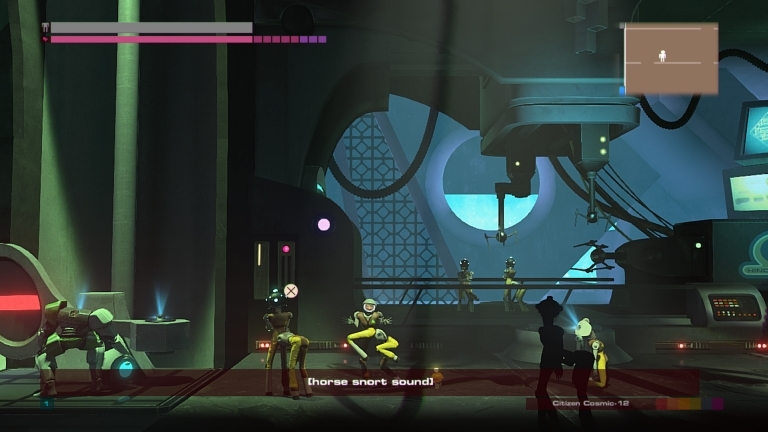 Speaking of those colored doors, they make up an important chunk of Headlander’s gameplay, which is classic metroidvania action executed superbly. 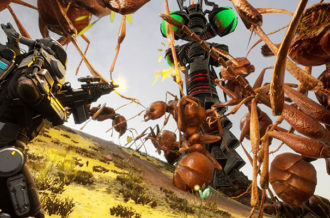 As mentioned earlier, you are but a disembodied head who can only fly around with a thruster, but thankfully you’re also armed with ability to vacuum off the heads of other droids and then attach yourself to their bodies, using them in a method similar to one of Double Fine’s previous games, Stacking. And while your head is able to navigate small, secret passages which you can hunt for around each map, you need bodies to get through each door, with certain ones locked off to colored security forces. A rainbow-colored spectrum is used to determine the rankings of who can enter what doors (red can enter red, orange can enter red and orange, purple can enter all doors, et cetera), so the meat of the game’s puzzles involves attempting to navigate each area and set things up in such a way that you can bring the right body to the right door or area (complicated by bodies being unable to jump). 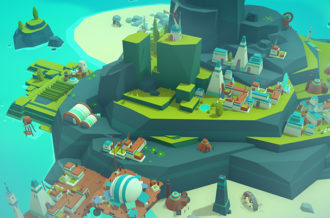 As expected, a lot of backtracking is involved, but things are always kept lively and varied enough to keep from being dull, and the difficulty level is always set at just the right escalating amount that provides a perfect challenge. It also helps that flying around vacuuming off enemy head controls like a dream and is always a blast to play with, along with the more action-oriented segments. 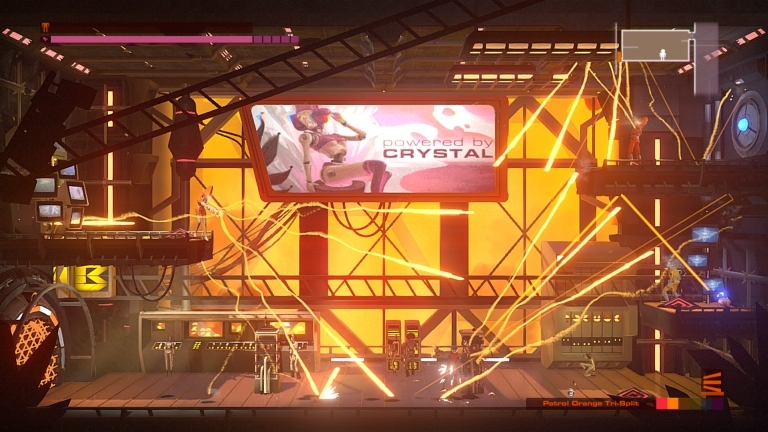 This leads us to the combat portion of Headlander, and if the goal was to deliver some good old-fashioned gunfights straight of a 1970s action film, then mission accomplished. Not only does the rainbow hierarchy determine which doors you can enter, but the higher up the scale you are, the more power you can dish out, with each bullet being able to bounce off walls in an increasing number of times as well. This means that at times, things almost resemble something out of a bullet hell game, with prismatic energy blasts flying all around you in a wild and gleefully chaotic fashion (especially with different troops being able to shoot up to four blasts at once). The analog controls on a controller don’t feel as smooth as a mouse, but still get the job done quite perfectly. What is more of an issue is the cover system, which requires you to approach a certain section from the right angle and hold down a button. It feels a bit clunky at times, especially in areas where enemies come at you from both sides. Honestly, it felt easier to just risk taking damage and switch to popping off enemy temples and grabbing fresh combat sentries when needed. You also get a set of unlockable skills along the way that you can develop through a tree, per tradition by this point. 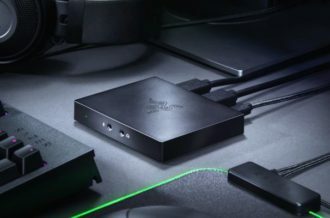 Not only does it provide you with a bevy of fun options to play with, such as being able to have bodies act as turrets or being able to slow down time, but they also have awesome effects such as shields formed entirely out of crystals or a dash that shows off multicolored silhouettes, making the upgrades you earn a treat to try out. You earn the upgrade points to purchase them with through various story missions, as well as exploring every nook and cranny for secret areas filled with energy, along with stations that can permanently boost your health, energy, and speed. And as expected with best of the genre, hunting down every one of these is a delight, with each secret again providing the perfect level of challenge needed to uncover. That being said back there about the combat being chaotic, though, there were two particular sections in the game filled with so much automated turret fire that major slowdown actually occurred, with one of those parts actually causing the game to crash in my case (the first time that had ever happened on my PS4 in the nearly three years that I’ve had it, as far as I can remember). 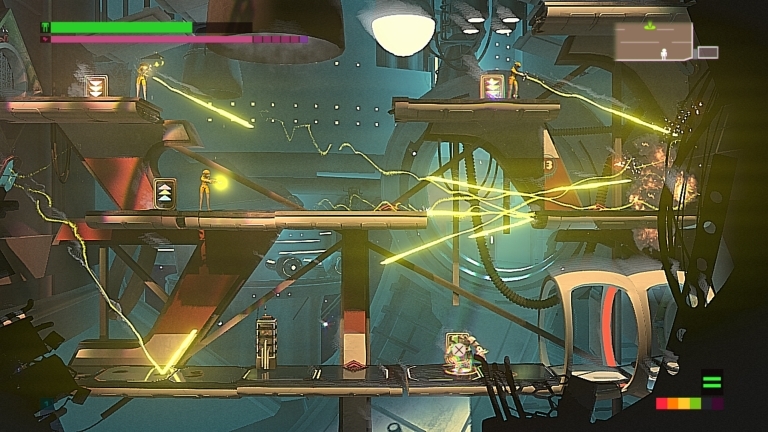 And as long as we’ve opened up that can of worms, Headlander isn’t without its flaws. For one, there are issues at times with enemies repsawning at inconvenient moments. Mind you, respawning is a necessity here, since certain bodies, enemies or otherwise, are needed to open various doors along the way. But there are more than few moments where it felt like either all of the enemies respawned in a room the moment you entered it again, or the enemy body you needed wouldn’t spawn at all. And while Headlander really is a great game on its own, you can spot the seeds of what should have been a much larger game in some the extra objectives it gives you, which feel a tad tacked on. Hey, you’ve discovered a secret rebel base with an audio recording in it! Now maybe you can find more and piece together the history of…oh wait, the recordings are only found in this one part of the game, and only about three of them are hidden while the rest are grouped together. Oooh, sidequests! Now you can earn more upgrade points and encounter more colorful characters that…oh wait, there’s only four of them in total. Well, since the setup is a bit like Stacking as mentioned, you can always hijack civilian bodies and see what wacky stuff they can do…oh wait, all they can do is dance. Which is humorous and leads to a trophy/achievement, but still feels slightly shallow. None of this is a deal-breaker, but it will make you wish that there was a bit more meat to things. Headlander lasts for roughly about nine hours or so, and that’s if you’re going for one hundred percent completion (although there are a few easter eggs in the post-game content to take a peek at as well). The story does follow the standard pattern of the utopia that secretly turns out to be a dystopia deep underneath with a few hopefuls attempting to take it down, but still ends up being highly engaging, and even manages to deliver a few twists and turns. 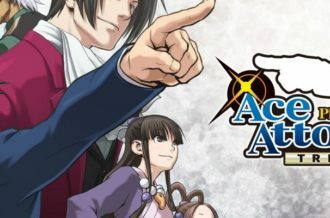 Again, the game’s astonishing retreaux world is one of the biggest reasons to keep going, but it is surprisingly easy to get addicted to the developing tale as things get even more mysterious as you head towards the climax. It is indeed a captivating journey, and one that just happens to involve you participating in a chess-themed deathmatch along the way. The moment you begin Headlander and see the VHS-style lines show up along with the formation of the old-school title with a blast of colors and a jaunty tune, you know you’re in for something good. And the moment you learn how to nail fifty headshots and earn a trophy called “The Gun is Good,” you know you’re in for a classic. The unique gimmick of being able to hijack enemy bodies builds upon the metrodvania standards quite beautifully and the over-the-top ’70s sci-fi setting provides a lot of jaw-dropping sights and scenery to experience. This is easily one of the year’s most enjoyable games and one you won’t be forgetting anytime soon. As dementedly fun as one of its hedonistic trips to the Fondlarium, Headlander is an amazing metroidvania game that you really need to check out.